The Wilier 903TRB Mountain Bike has quality everywhere you look. From the robust aluminium frame, to the RockShox fork with 140mm of travel and rear shock, a Shimano XT 1x11 drivetrain and hydraulic disc brakes. 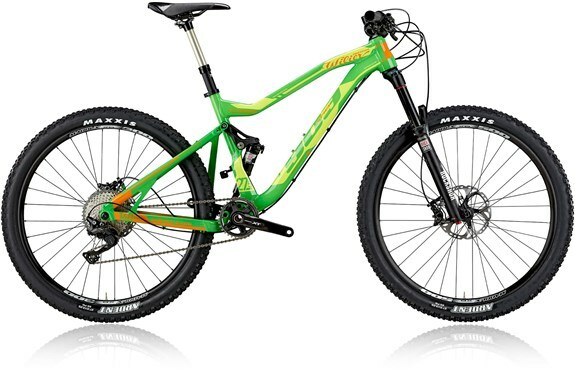 You can enjoy a terrain-dominating performance from this full suspension aluminium MTB. Wilier’s engineers wanted to develop an off-road MTB that would be fun without sacrificing performance for those who wanted to race. By including a floating shock suspension and a patented virtual pivot point based system, Wilier managed to achieve this goal. The first thing you will notice when you look at the 903TRB is that the shock absorber is not anchored directly onto the frame at a certain point, but floats between two links connecting the rear seatstays. This bespoke design boosts pedal power to help you ride uphill with greater efficiency as it gives the bike a low bobbing level and a low pedal kick back. Front Tyre: Maxxis Ardent 650B x 2.25"
Rear Tyre: Maxxis Ardent 650B x 2.25"